Why Isn’t Facebook Talking About Sydney’s Free Cannabis Picnic? There is an amazing cannabis event coming up this weekend in Sydney’s Victoria Park. If you haven’t heard about it, it might have to do with censorship. There is an amazing cannabis event coming up this weekend in Sydney. If you haven’t heard about it, it might have to do with censorship on Facebook. Free Cannabis NSW, the group hoping to bring full legalization to the territory, has no plans to stop the event, so get the word out and have all your mates come! 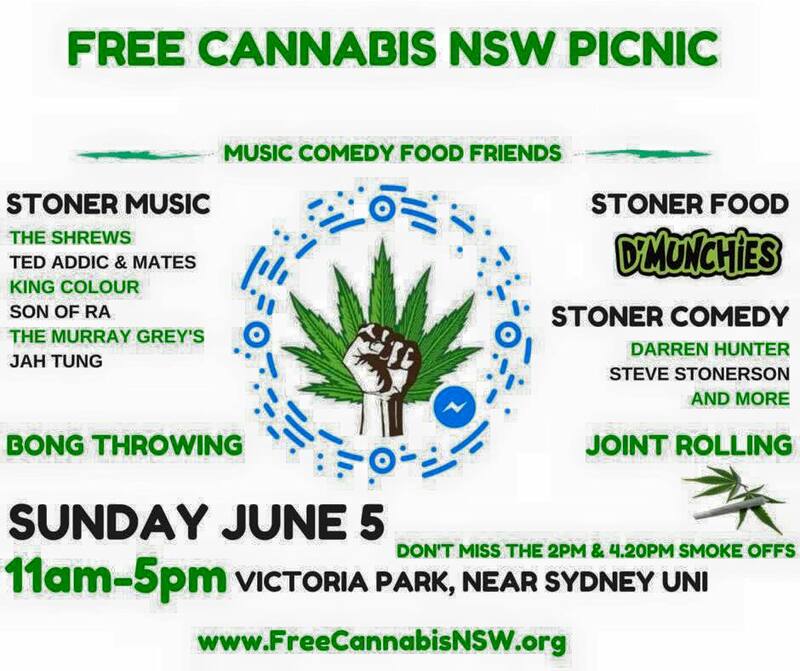 Shortly after concluding their similar “peaceful act of disobedience” this year for the April 20th cannabis holiday, the activist group Free Cannabis New South Wales posted the plans for another picnic/mass smoke out this Sunday, June 5th. Food at the event will be provided by Newtown’s epic herbal appetite inspired café D’Munchies. The soon-to-launch Australian cannabis media site, ironically named Dopamine.net.au, will be using the event to soft launch their site. Unfortunately, despite the name of the group hosting the event, FSNSW will not be handing out free cannabis. Free Cannabis NSW had advertised the upcoming event on their Facebook page, but according to a spokesperson, the event page was suddenly taken down a couple days ago. The event page had been up since April and had 1,500 people RSVP’d and 3,000 interested. Four days before this event, without any information or communication, they (Facebook) decided to delete it and I sincerely think it has to do with someone complaining, perhaps from NSW Police or the community, who doesn’t like cannabis. We’ve got other picnic events for other states, like one in Brisbane on 18th June, and that Facebook event is still up. They’ve simply deleted the biggest one and that’s going to be the kind of historic one. It was a mistake to pull down the page and that they are trying to reinstate it with all the people who were attending re-connected to it. The page appears to actually be back up as of today, the 2nd, but only shows 268 interested and 145 going. The reconnection appears to be a failure, but it appears the previous people planning to attend have been re-invited. Will you be attending the picnic to promote full legalization in New South Wales? Share with us on social media or in the comments below.